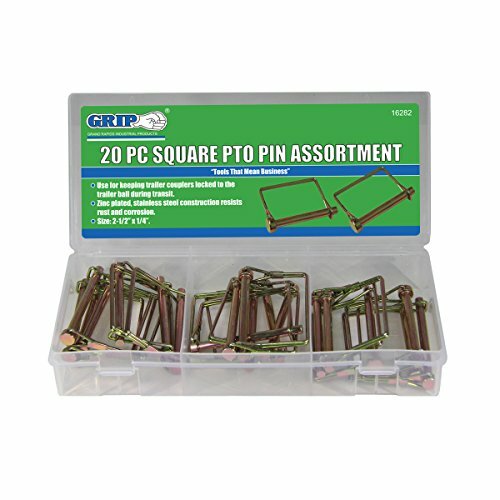 Grip Lynch Pin Assortments (20 pc Square PTO) by Grip at In The National Interest. MPN: Grip. Hurry! Limited time offer. Offer valid only while supplies last. Use for keeping trailer couplers locked to the trailer ball during transit. Zinc plated, stainless steel construction resists rust and corrosion. Zinc plated, stainless steel construction resists rust and corrosion. View More In Hitch Pins. If you have any questions about this product by Grip, contact us by completing and submitting the form below. If you are looking for a specif part number, please include it with your message.